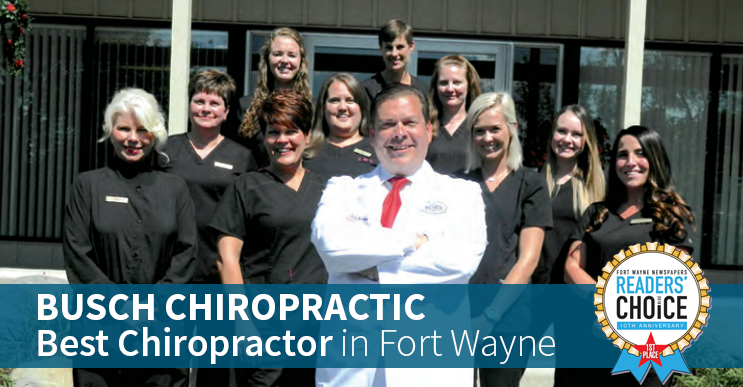 Dr. Busch and his team at Busch Chiropractic are pleased to have been voted best chiropractor in Fort Wayne for another year in the Reader's Choice awards. A sincere thank you to our patients and the community for voting us number one! Busch Chiropractic Pain Center founded by Dr. Richard Busch III began treating patients in 1996 with nonsurgical, patient-centered health care. Early in practice, Dr. Busch realized he was seeing a tier of patients that needed more than standard chiropractic care. Many were suffering from herniated and degenerative discs, sciatica, stenosis, and other conditions. Some were looking at the prospect of surgery. Over 22 years ago, Dr. Busch developed the DRS Protocol™ to treat that tier of patient. Now surgery is not the only option, Dr. Busch incorporated multiple therapies, including nonsurgical spinal decompression, to successfully treat thousands of patients with lumbar and cervical conditions. The protocol addresses patients’ underlying conditions that are the cause of pain and not just masking the symptoms. “Often, a patient’s path in searching for relief would be medications, therapy, injections and even then many were facing surgery,” said Dr. Busch. “A fact I know well, as I treat many patients who are the same or worse following surgery. This condition has a name - failed back surgery. Often, post-surgical patients are turned over to pain management and believe they just have to live with their pain and limitations. I can offer help even for failed back surgery patients. Treating patients without surgery and drugs has always been a primary goal of Dr. Busch. He developed the Busch Neuropathy Protocol™ to treat symptoms of peripheral neuropathy. Dr. Busch has continued to research many treatment technologies that would complement patients’ care and has developed alternative treatments for many conditions causing knee pain and carpal tunnel syndrome.